A doughnut or donut (/ˈdoʊnət/ or /ˈdoʊnʌt/; see spelling differences) is a type of fried dough confectionery or dessert food. The doughnut is popular in many countries and prepared in various forms as a sweet snack that can be homemade or purchased in bakeries, supermarkets, food stalls, and franchised specialty outlets. Donuts are usually deep-fried from a flour dough, and typically either ring-shaped or without a hole, and often filled. Other types of batters can also be used, and various toppings and flavorings are used for different types, such as sugar, chocolate, or maple glazing. In addition to flour, doughnuts may also include such ingredients as water, leavening, eggs, milk, sugar, oil/shortening, natural flavors and/or artificial flavors. The two most common types are the toroidal ring doughnut and the filled doughnut - which is injected with fruit preserves, cream, custard, or other sweet fillings. A small spherical piece of dough may be cooked as a doughnut hole. Other shapes include rings, balls, and flattened spheres, as well as ear shapes, twists and other forms. Doughnut varieties are also divided into cake and risen type doughnuts. Ring doughnuts are formed by joining the ends of a long, skinny piece of dough into a ring or by using a doughnut cutter, which simultaneously cuts the outside and inside shape, leaving a doughnut-shaped piece of dough and a doughnut hole from dough removed from the center. This smaller piece of dough can be cooked or added back to the batch to make more doughnuts. A disk-shaped doughnut can also be stretched and pinched into a torus until the center breaks to form a hole. Alternatively, a doughnut depositor can be used to place a circle of liquid dough (batter) directly into the fryer. There are two types of ring doughnuts, those made from a yeast-based dough for raised doughnuts or made from a special type of cake batter. Yeast-raised doughnuts contain about 25% oil by weight, whereas cake doughnuts' oil content is around 20%, but they have extra fat included in the batter before frying. Cake doughnuts are fried for about 90 seconds at approximately 190 °C to 198 °C, turning once. Yeast-raised doughnuts absorb more oil because they take longer to fry, about 150 seconds, at 182 °C to 190 °C. Cake doughnuts typically weigh between 24 g and 28 g, whereas yeast-raised doughnuts average 38 g and are generally larger, and taller (due to rising) when finished. After frying, ring doughnuts are often topped. Raised doughnuts are generally covered with a glaze (icing). Cake doughnuts can also be glazed, or powdered with confectioner's sugar, or covered with cinnamon and granulated sugar. They are also often topped with cake frosting (top-side only) and sometimes sprinkled with coconut, chopped peanuts, or sprinkles (also called jimmies). Doughnut holes are small, bite-sized doughnuts that were traditionally made from the dough taken from the center of ring doughnuts. Before long, doughnut sellers saw the opportunity to market "holes" as a novelty and many chains offer their own variety, some with their own brand names such as "Munchkins" from Dunkin' Donuts and "Timbits" from Tim Hortons. Traditionally, doughnut holes are made by frying the dough removed from the center portion of the doughnut. Consequently, they are considerably smaller than a standard doughnut and tend to be spherical. Similar to standard doughnuts, doughnut holes may be topped with confections, such as glaze or powdered sugar. Originally, most varieties of doughnut holes were derivatives of their ring doughnut (yeast-based dough or cake batter) counterparts. However, doughnut holes can also be made by dropping a small ball of dough into hot oil from a specially shaped nozzle or cutter. This production method has allowed doughnut sellers to produce bite-sized versions of non-ring doughnuts, such as filled doughnuts, fritters and Dutchies. The filled doughnut is a flattened sphere injected with fruit preserves, cream, custard, or other sweet fillings, and often dipped into powdered sugar or topped off with frosting. Common varieties include the Boston cream, coconut, key lime, and jelly. Others include the fritter and the Dutchie, which are usually glazed. These have been available on Tim Hortons' doughnut menu since the chain's inception in 1964, and a 1991 Toronto Star report found out that these two were the chain's most popular type of fried dough in Canada. There are many other specialized doughnut shapes such as old-fashioned, bars or Long Johns (a rectangular shape), or with the dough twisted around itself before cooking. In the northeast U.S., bars and twists are usually referred to as crullers. Another is the beignet, which is square-shaped, covered with powdered sugar. Doughnuts have a disputed history. One theory suggests they were invented in North America by Dutch settlers, and in the 19th century, doughnuts were sometimes referred to as one kind of oliekoek (a Dutch word literally meaning "oil cake"), a "sweetened cake fried in fat." Hanson Gregory, an American, claimed to have invented the ring-shaped doughnut in 1847 aboard a lime-trading ship when he was only 16 years old. Gregory was dissatisfied with the greasiness of doughnuts twisted into various shapes and with the raw center of regular doughnuts. He claimed to have punched a hole in the center of dough with the ship's tin pepper box, and to have later taught the technique to his mother. Smithsonian Magazine states that his mother, Elizabeth Gregory, "made a wicked deep-fried dough that cleverly used her son's spice cargo of nutmeg and cinnamon, along with lemon rind," and "put hazelnuts or walnuts in the center, where the dough might not cook through", and called the food 'doughnuts'. According to anthropologist Paul R. Mullins, the first cookbook mentioning doughnuts was an 1803 English volume which included doughnuts in an appendix of American recipes. By the mid-19th century, the doughnut looked and tasted like today’s doughnut, and was viewed as a thoroughly American food. Another theory on their origin came to light in 2013, appearing to predate all previous claims, when a recipe for "dow nuts" was found in a book of recipes and domestic tips written in 1800 by the wife of Baron Thomas Dimsdale, the recipe being given to the dowager Baroness by an acquaintance who transcribed for her the cooking instructions of a local delicacy, the "Hertfordshire nut". The earliest known recorded usage of the term dates to an 1808 short story describing a spread of "fire-cakes and dough-nuts." Washington Irving's reference to "doughnuts" in 1809 in his History of New York is more commonly cited as the first written recording of the term. Irving described "balls of sweetened dough, fried in hog's fat, and called doughnuts, or olykoeks." These "nuts" of fried dough might now be called doughnut holes. Doughnut is the more traditional spelling, and still dominates outside the US. At present, doughnut and the shortened form donut are both pervasive in American English. The first known printed use of donut was in Peck's Bad Boy and his Pa by George W. Peck, published in 1900, in which a character is quoted as saying, "Pa said he guessed he hadn't got much appetite, and he would just drink a cup of coffee and eat a donut." According to John T. Edge (Donuts, an American passion 2006) the alternative spelling “donut” was invented when the New York–based Display Doughnut Machine Corporation abbreviated the word to make it more pronounceable by the foreigners they hoped would buy their automated doughnut making equipment. The donut spelling also showed up in a Los Angeles Times article dated August 10, 1929 in which Bailey Millard jokingly complains about the decline of spelling, and that he "can't swallow the 'wel-dun donut' nor the ever so 'gud bred'." The interchangeability of the two spellings can be found in a series of "National Donut Week" articles in The New York Times that covered the 1939 World's Fair. In four articles beginning October 9, two mention the donut spelling. Dunkin' Donuts, which was so-named in 1950, following its 1948 founding under the name Open Kettle (Quincy, Massachusetts), is the oldest surviving company to use the donut variation; other chains, such as the defunct Mayflower Doughnut Corporation (1931), did not use that spelling. According to the Oxford Dictionary while "doughnut" is used internationally, the spelling "donut" is American. The spelling "donut" remained rare until the 1950s, and has since grown significantly in popularity; this growth in use has possibly been influenced by the spread of Dunkin' Donuts. National Doughnut Day, also known as National Donut Day, celebrated in the United States of America, is on the first Friday of June each year, succeeding the Doughnut Day event created by The Salvation Army in 1938 to honor those of their members who served doughnuts to soldiers during World War I. About 250 Salvation Army volunteers went to France. Because of the difficulties of providing freshly baked goods from huts established in abandoned buildings near the front lines, the two Salvation Army volunteers (Ensign Margaret Sheldon and Adjutant Helen Purviance) came up with the idea of providing doughnuts. These are reported to have been an "instant hit", and "soon many soldiers were visiting The Salvation Army huts". Margaret Sheldon wrote of one busy day: "Today I made 22 pies, 300 doughnuts, 700 cups of coffee." Soon, the women who did this work became known by the servicemen as "Doughnut Dollies". In South Africa, an Afrikaans variation known as the koeksister is popular. Another variation, similar in name, is the Cape Malay koesister being soaked in a spiced syrup and coated in coconut. It has a texture similar to more traditional doughnuts as opposed to the Afrikaans variety. A further variation is the vetkoek, which is also dough deep fried in oil. It is served with mince, syrup, honey or jam. In Tunisia, a pastry similar to doughnuts are yo-yos. They are very traditional and popular. They come in different versions both as balls and in shape of doughnuts. They are deep-fried and covered in a honey syrup or a kind of frosting. Sesame seeds are also used for flavor and decoration along with orange juice and vanilla. In Morocco, Sfenj is a similar pastry eaten sprinkled with sugar or soaked in honey. A few sweet, doughnut-style pastries are regional in nature. Cantonese cuisine features an oval-shaped pastry called ngàuhleisōu (牛脷酥, lit. "ox-tongue pastry" due to its tongue-like shape). A spherical food called saa1 jung (沙翁) which is also similar to cream puff, but denser in texture (doughnut-like texture) with sugar sprinkled on top, is normally available in Cantonese restaurants in the dim sum style. An oilier Beijing variant of this called 高力豆沙, gaoli dousha, is filled with red bean paste; originally, it was made with egg white instead of dough. Many Chinese cultures make a chewy doughnut known as shuangbaotai (雙包胎), which consists of two conjoined balls of dough. Chinese restaurants in the US sometimes serve small fried pastries similar to doughnut holes, served with condensed milk as a sauce. Chinese cuisine features long, deep-fried doughnut sticks that are often quite oily, hence their name in Mandarin, yóutiáo (油條, lit. oil strips. ); in Cantonese, this doughnut-style pastry is called yàuhjagwái (油炸鬼, ghosts fried in oil). These pastries are not sweet and are often served with congee, a traditional rice porridge. In India, a savory, fried, ring-shaped snack called a vada is often referred to as the Indian doughnut. The vada is made from dal, lentil or potato flours rather than wheat flour. In North India, it is in the form of a bulging disc called dahi-vada, and is soaked in curd, sprinkled with spices and sliced vegetables, and topped with a sweet and sour chutney. In South India, a vada is eaten with sambar and a coconut chutney. Sweet pastries similar to old-fashioned doughnuts called badushahi and jalebi are also popular. Balushahi, also called badushah, is made from flour, deep fried in clarified butter, and dipped in sugar syrup. Balushahi is ring-shaped, but the hole in the center does not go all the way through. Jalebi, which is typically pretzel-shaped, is made by deep frying batter in oil and soaking it in sugar syrup. A variant of jalebi, called imarti, is shaped with a small ring in the center around which a geometric pattern is arranged. Along with these Indian variants, American variants of doughnuts are also available with American brands such as Krispy Kreme and Dunkin' Donuts setting up retail outlets in India, as well as local brands such as Mad Over Donuts and the Donut Baker. The Indonesian, donat kentang is a potato doughnut, a ring-shaped fritter made from flour and mashed potatoes, coated in powder sugar or icing sugar. The Persian zoolbia and bamiyeh are fritters of various shapes and sizes coated in a sugar syrup. Doughnuts are also made in the home in Iran, referred to as doughnuts, even in the singular. Jelly doughnuts, known as sufganiyah (סופגניה, pl. sufganiyot סופגניות) in Israel, have become a traditional Hanukkah food in the recent era, as they are cooked in oil, associated with the holiday account of the miracle of the oil. Traditional sufganiyot are filled with red jelly and topped with icing sugar. However, many other varieties exist, with some being filled with dulce de leche (particularly common after the South American aliyah early in the 21st century). In Japan, an-doughnut (あんドーナッツ, "bean paste doughnut") is widely available at bakeries. An-doughnut is similar to Germany's Berliner, except it contains red azuki bean paste. Mister Donut is one of the most popular doughnut chains in Japan. Native to Okinawa is a spheroid pastry similar to doughnuts called sata andagi. Kuih keria is a hole doughnut made from boiled sweet potato that is mashed. The sweet potato mash is shaped into rings and fried. The hot doughnut is then rolled in granulated sugar. The result is a doughnut with a sugar-crusted skin. 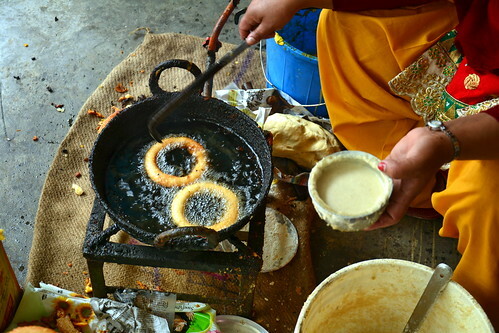 Sel roti is a Nepali homemade, ring-shaped, rice doughnut prepared during Tihar, the widely celebrated Hindu festival in Nepal. A semiliquid dough is usually prepared by adding milk, water, sugar, butter, cardamom, and mashed banana to rice flour, which is often left to ferment for up to 24 hours. A sel roti is traditionally fried in ghee. Doughnuts are available at most bakeries across Pakistan. The Navaz Sharif variety, available mainly in the city of Karachi, is covered in chocolate and filled with cream, similar to a Boston cream. Doughnuts can readily be found at the many Dunkin' Donuts branches spread across Pakistan. Local varieties of doughnuts sold by peddlers and street vendors throughout the Philippines are usually made of plain well-kneaded dough, deep-fried in refined coconut oil and sprinkled with refined (not powdered or confectioner's) sugar. Doughnuts are a popular mid-day snack. A native variant from the Visayas islands known as shakoy or siyakoy (also known as lubid-lubid in the northern Philippines) uses a length of dough twisted into a distinctive rope-like shape before being fried. The preparation is almost exactly the same as doughnuts, though there are variants made from glutinous rice flour. The texture can range from soft and fluffy, to sticky and chewy, to hard and crunchy. They are sprinkled with white sugar, but can also be topped with sesame seeds or caramelized sugar. In Taiwan, shuāngbāotāi (雙胞胎, lit. twins) is two pieces of dough wrapped together before frying. In Thailand, a popular breakfast food is Pa Thong Ko, also known as Thai Donuts, a version of the Chinese Yiu Ja Guoy/Youtiao. Often sold from food stalls in markets or by the side of the road, these doughnuts are small sometimes X-shaped and sold by the bag full. They are often eaten in the morning with hot Thai tea. Vietnamese varieties of doughnuts include bánh tiêu, bánh cam, and bánh rán. Bánh tiêu is a sesame-topped, deep-fried pastry that is hallow. It can be eaten alone or cut in half and served with bánh bò, a gelatinous cake, placed inside the pastry. Bánh cam is from Southern Vietnam and is a ball-shaped, deep-fried pastry coated entirely in sesame seeds and inside of which contains a mung bean paste filling. Bánh rán is from Northern Vietnam and is similar to bánh cam; however, the difference is that bánh rán is covered with a sugar glaze after being deep-fried and its mung bean paste filling includes a jasmine essence. In Austria, doughnut equivalents are called Krapfen. They are especially popular during Carneval season (Fasching), and do not have the typical ring shape, but instead are solid and usually filled with apricot jam (traditional) or vanilla cream (Vanillekrapfen). A second variant, called Bauernkrapfen, probably more similar to doughnuts, are made of yeast dough, and have a thick outside ring, but are very thin in the middle. In Belgium, the smoutebollen in Dutch, or "croustillons" in French, are similar to the Dutch kind of oliebollen, but they usually do not contain any fruit, except for apple chunks sometimes. They are typical carnival and fair snacks and are coated with powdered sugar. Doughnuts similar to the Berliner are prepared in the northern Balkans, particularly in Bosnia and Herzegovina, Croatia, Macedonia and Serbia (pokladnice or krofne). They are also called krofna, krafna or krafne, a name derived from the Austrian Krapfen for this pastry. In Croatia, they are especially popular during Carneval season and do not have the typical ring shape, but instead are solid. Traditionally, they are filled with jam (apricot or plum). However, they can be filled with vanilla or chocolate cream. Another types of doughnuts are uštipci and fritule. There are Czech Republic "American" style doughnuts, but before they were solid shape and filled with jelly (strawberry or peach). The shape is similar to doughnuts in Germany or Poland. They are called Kobliha (Koblihy in plural). They may be filed with nougat or with vanilla custard. There are now many fillings; cut in half or non-filled knots with sugar and cinnamon on top. In Denmark, doughnuts exist in their "American" shape, and these can be obtained from various stores, e.g. McDonald's and most gas stations. The Berliner, however, is also available in bakeries. in Finland, a sweet doughnut is called a munkki (the word also means monk) and are commonly eaten in cafés and cafeteria restaurants. They are sold cold and are sometimes filled with jam (U.S. jelly) or a vanilla sauce. A ring doughnut is also known as donitsi.A savory form of doughnut is the meat doughnut (in Finnish lihapiirakka, or literally meat pie). Being made of doughnut mixture and deep fried the end product is more akin to a savory doughnut than any pie known in the English speaking world. The French beignet, literally "bump", is the French and New Orleans equivalent of a doughnut: A pastry made from made from deep-fried choux pastry. In parts of Germany, the doughnut equivalents are called Berliner (sg. and pl. ), but not in the capital city of Berlin itself and neighboring areas, where they are called Pfannkuchen (which is often found misleading by people in the rest of Germany, who use the word Pfannkuchen to describe a pancake, which is also the literal translation of it). In middle Germany, they are called Kreppel or Pfannkuchen. In southern Germany, they are also called Krapfen and are especially popular during Carnival season (Karneval/Fasching) in southern and middle Germany and on New Year's Eve in northern Germany. Berliner do not have the typical ring shape, but instead are solid and usually filled with jam, while a ring-shaped variant called Kameruner is common in Berlin and eastern Germany. Bismarcks and Berlin doughnuts are also found in Australia, Canada, Denmark, Finland, Switzerland and the U.S. Today, American style doughnuts are also available in Germany, but are less popular than their native counterparts. In Greece, there is a doughnut-like snack, called loukoumas (λουκουμάς), which is a doughnut with sugar and comes in two types (one is shaped like the number 8; the other is a torus). The first one is crispier, whereas the second one is larger and softer. Fánk is a sweet traditional Hungarian cake. The most commonly used ingredients are: flour, yeast, butter, egg yolk, a little bit of rum, a sniff of salt, milk and oil to deep fry with. After the pastry has risen for approximately 30 minutes the result is an extreme light doughnut-like pastry. Fánk is mostly served with powdered sugar and lekvar. It is supposed that Fánk pastry is of the same origin as German Berliner, Dutch oliebol, and Polish pączki. In Iceland kleinuhringur (pl. kleinuhringir and kleinuhringar) are a type of old Icelandic cuisine which resembles doughnuts. The Berliner and many other kinds of doughnuts can only be found on one day of the year and that is on a holiday called "Bolludagur" or in other words Doughnut Day. Italian doughnuts include ciambelle, krapfen, zippuli and zeppole from Calabria, maritozzi and bomboloni from Tuscany. In Lithuania, a kind of doughnut called spurgos is widely known. Some spurgos are similar to Polish pączki, but some specific recipes, such as cottage cheese doughnuts (varškės spurgos), were invented independently. In the Netherlands, oliebollen, referred to in cookbooks as "Dutch doughnuts", are a type of fritter, with or without raisins or currants, and usually sprinkled with powdered sugar. Variations of the recipe contain slices of apple or other fruits. They are traditionally eaten as part of New Year celebrations. In Norway, the traditional smultring is the prevailing type of doughnut traditionally sold in bakeries, shops, and stalls, however the American-style doughnuts are widely available in larger supermarkets, McDonald's restaurants, 7-elevens and bakeries. The Berliner is more common than the US doughnut, and sold in most supermarkets and bakeries alongside smultring doughnuts. In Poland and parts of the U.S. with a large Polish community, like Chicago and Detroit, the round, jam-filled doughnuts eaten especially - though not exclusively - during the Carnival are called pączki (pronounced [ˈpɔntʂkʲi]). Pączki have been known in Poland at least since the Middle Ages. Jędrzej Kitowicz has described that during the reign of the August III under influence of French cooks who came to Poland at that time, pączki dough fried in Poland has been improved, so that pączki became lighter, spongier, and more resilient. The Romanian dessert gogoși are fried dough balls similar to filled doughnuts. They are stuffed with chocolate, jam, cheese and other combinations and may be dusted with icing sugar. In Russia and the CIS countries, ponchiki (Russian: пончики, plural form of пончик, ponchik) or pyshki (Russian: пышки, especially in St. Petersburg) are a very popular sweet doughnut, with many fast and simple recipes available in Russian cookbooks for making them at home as a breakfast or coffee pastry. In Ukraine and Belarus they are called pampushky (Ukrainian: пампушки). In Slovenia, a jam-filled doughnut known as krofi, is very popular. It is the typical sweet during Carnival time, but is to be found in most bakeries during the whole year. The most famous krofi come from the village of Trojane in central Slovenia, and are originally filled with apricot jam filling. In Spain, there are two different types of doughnuts. The first one, simply called "donuts" (in reference to the most famous commercial brand name for this type of food) or "berlinas" (a more traditional name), refer to the American-style doughnut, that is, a deep fried, sweet, soft, ring of flour dough. The second type of doughnut is a traditional pastry called "rosquilla", made of fermented dough and which is fried or baked in an oven. They were purportedly introduced in Spain by the Romans. In Spain, there are several variants of them depending on the region where they are prepared and on the time of the year they are sold, as they are regarded in some parts as a pastry especially prepared only for Easter. Although overall they result in pastries of a tighter texture and less sugared than American doughnuts, they differ greatly in shape, size and taste from one region to another. The 'churro' is a sweet pastry of deep-fried dough similar to a doughnut but shaped as a long, thin, ribbed cylinder rather than a ring or sphere. Churros are commonly served dusted in sugar as a snack or with a cup of hot chocolate. In Switzerland, there are Zigerkrapfen and Berliner. In some parts of Scotland, ring doughnuts are referred to as doughrings, with the 'doughnut' name being reserved exclusively for the nut-shaped variety. Glazed, twisted rope-shaped doughnuts are known as yum-yums. It is also possible to buy fudge doughnuts in certain regions of Scotland. Fillings include jam, custard, cream, sweet mincemeat, chocolate and apple. Common ring toppings are sprinkle-iced and chocolate. In Northern Ireland, ring doughnuts are known as 'gravy rings', gravy being an archaic term for hot cooking oil. A doughnut known as "kurma" originating in Eastern India but being sold as a delicacy in Trinidad and Tobago, is a small, sweet, and fried cubed or rectangular-shaped doughnut. A traditional Puntarenas cream-filled doughnut is round and robust, managing to keep the cream inside liquified. They are popular in Costa Rica. The Mexican donas are similar to doughnuts, including the name; the dona is a fried-dough pastry-based snack, commonly covered with powdered brown sugar and cinnamon, white sugar or chocolate. Frosted, glazed, powdered, Boston cream, coconut, sour cream, cinnamon, chocolate, and jelly are some of the varieties eaten in the United States and Canada. Sweetening, filling, and fancy toppings are now so common that plain doughnuts are now commonly labeled and sold as "old fashioned". There are also potato doughnuts (sometimes referred to as spudnuts). Doughnuts are ubiquitous in the United States and can be found in most grocery stores, as well as in specialty doughnut shops. A popular doughnut in Hawaii is the malasada. Malasadas were brought to the Hawaiian Islands by early Portuguese settlers, and are a variation on Portugal's filhós. They are small eggy balls of yeast dough deep-fried and coated in sugar. Immigrants have brought various doughnut varieties to the United States. To celebrate Fat Tuesday in eastern Pennsylvania, churches sell a potato starch doughnut called a Fastnacht (or Fasnacht). The treats are so popular there that Fat Tuesday is often called Fastnacht Day. The Polish doughnut, the pączki, is popular in U.S. cities with large Polish communities such as Chicago, Milwaukee, and Detroit. In regions of the country where apples are widely grown, especially the Northeast and Midwest states, cider doughnuts are a harvest season specialty, especially at orchards open to tourists, where they can be served fresh. Cider doughnuts are a cake doughnut with apple cider in the batter. The use of cider affects both the texture and flavor, resulting in a denser, moister product. They are often coated with either granulated or powdered sugar or cinnamon sugar. In Southern Louisiana, a popular variety of the doughnut is the beignet, a fried, square doughnut served traditionally with powdered sugar. Perhaps the most famous purveyor of beignets is New Orleans restaurant Cafe Du Monde. In Quebec, homemade doughnuts called beignes de Noël are traditional Christmas desserts. In Australia, the doughnut is a popular snack food. Jam doughnuts are particularly popular and a unique aspect of Australian culture, especially in Melbourne, Victoria and the Queen Victoria Market, where they are a tradition. Jam doughnuts are similar to a Berliner, but are served hot with red jam (raspberry or strawberry) injected into a bun that is deep-fried and then frosted in either sugar or cinnamon. Jam doughnuts are sometimes also bought frozen. In South Australia, they are known as Berliner or Kitchener and often served in cafes. A variant is the custard-filled doughnut. Mobile vans that serve doughnuts, traditional or jam, are often seen at spectator events, carnivals and fetes and by the roadside near high-traffic areas like airports and the carparks of large shopping centers. Traditional cinnamon doughnuts are readily available in Australia from specialised retailers and convenience stores. Doughnuts are a popular choice for schools and other not-for-profit groups to cook and sell as a fundraiser. In New Zealand, the doughnut is a popular food snack available in corner dairies. They are in the form of a long sweet bread roll with a deep cut down its long axis. In this cut is placed a long dollop of sweetened clotted cream and on top of this is a spot of strawberry jam. Doughnuts are of two varieties: fresh cream or mock cream. The rounded variety is widely available as well. In Brazil, bakeries, grocery stores and pastry shops sell ball-shaped doughnuts popularly known as "sonhos" (lit. dreams). The dessert was brought to Brazil by Portuguese colonizers that had contact with Dutch and German traders. They are the equivalent of nowadays "bolas de Berlim" (lit. balls of Berlin) in Portugal, but the traditional Portuguese yellow cream was substituted by local dairy and fruit products. They are made of a special type of bread filled with "goiabada" (guava jelly) or milk cream, and covered by white sugar. Berlin (plural Berlines) doughnut is popular in Chile because of the large German community. It may be filled with jam or with manjar, the Chilean version of dulce de leche. Peruvian cuisine includes picarones which are doughnut-shaped fritters made with a squash and sweet potato base. These snacks are almost always served with a drizzle of sweet molasses-based sauce.